With the latest series of Pokémon games, I’ve been seeing the word “Ditto” being thrown around. Naturally, they must be referring to the device pictured above. 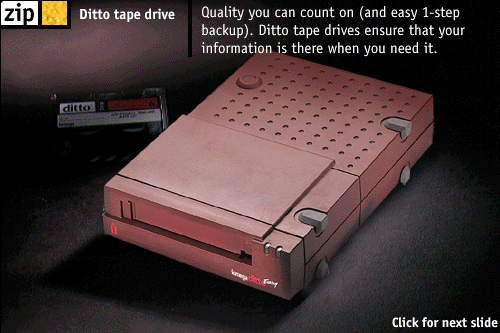 The Iomega Ditto was a personal tape backup storage drive from the same mob who developed the Zip drive, and the Bernoulli box before then. I remember seeing information about the Ditto on a demo CD that came with my other Iomega drives, and I was nerdy enough to still have a copy of it around to run in a VM. I liked how it also came in a colour other than beige, even before the first iMac. The Jaz was green and the Zip was blue. The Bernoulli box was… beige. But still! What blew my child mind however was the capacity of the tape cartridges. They were talking about gigabytes of storage in the late 1990s. Of course, I didn’t understand sequential versus random access, and that I wouldn’t be using it for day-to-day data. Still, I thought to myself I’d upgrade my Zip drive to a Jaz drive when I was older, and that I’d know I’d have grown up when I could afford to get a Ditto drive to store my amassed data on. Needless to say, I was a very nerdy kid. Did I mention that? As an addendum, I consider Red and Blue to be the only real Pokémom games. The rest are just like the last few Harry Potter books. Read into that how you wish.